Happy Friday! Yesterday the sun was shining in full force and it looks like the weekend is going to be gorgeous too. We’ve had our patio furniture stored in the garage all winter long and the plan is to finally pull it out tomorrow and start enjoying outdoor living. This summer I’m dreaming of an outdoor oasis where I can kick back and relax or have some friends over for an afternoon cocktail. Are you with me? Last fall my husband and I were out shopping for furniture for our newly finished basement when we came across a going-out-of-business sale on outdoor furniture. It’s always so unfortunate when businesses fail, but it was nice to be able to score two loungers made by Mountain House Furniture. We have wanted a pair since we completed the deck addition a couple years ago, but found they were either cheap looking or very expensive. I’m sure many of you know what I’m talking about. These ones are beautifully constructed in high quality virofiber with solid mechanisms, and heavy enough they won’t blow away in a voracious wind. They’re very similar to this black one, but in a multi-toned coffee color. (I’ll snap some photos this weekend once we pull them out). The loungers didn’t come with cushions (or that gorgeous pool…sigh), so yesterday I started looking for ready-mades that would work. If I can’t find anything suitable in size, quality, or color, I plan on getting them made. 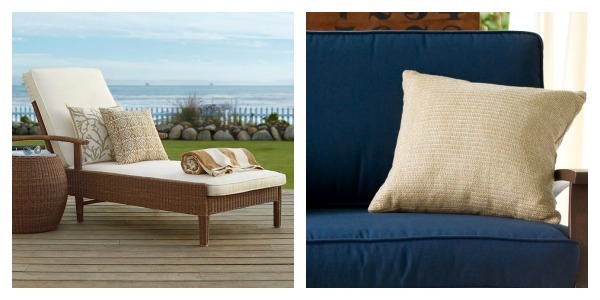 I’m leaning towards natural linen or navy cushions to complement our outdoor decorating scheme. Of course I may change my mind if I’m inspired by something else! Speaking of outdoor living, have you started your projects for the Outdoor Extravaganza yet? 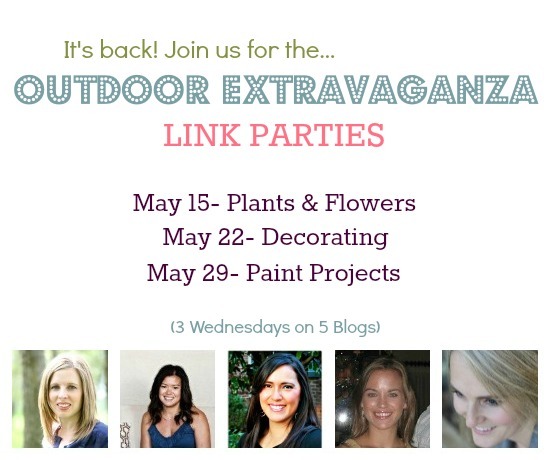 The Plants & Flowers link party is on May 15, so there’s still time to get ready for it. Would love to see you there! 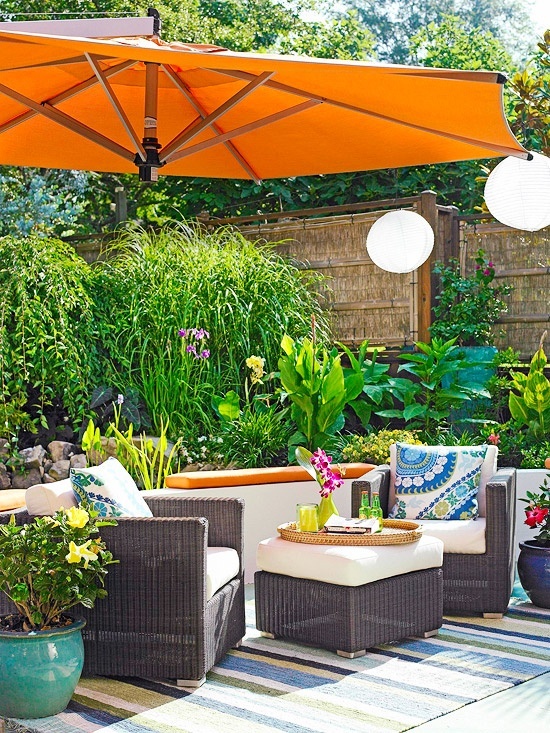 Hope the sun shines wherever you are this weekend so you can start enjoying your outdoor living space, too! 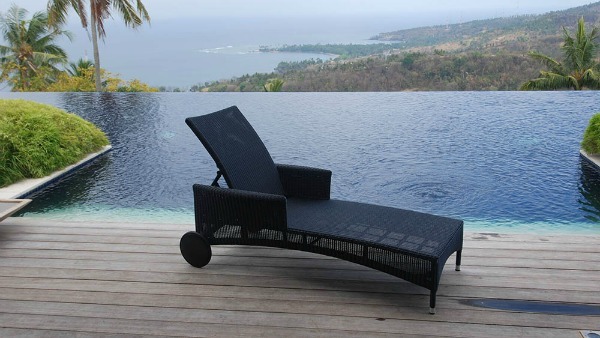 Enjoy your sunshine Shauna and thanks for the beautiful patio furniture inspiration! Great photos – I can’t wait to set up the outdoor furniture! I’m sure you’ll enjoy those loungers this year! Hey Dani, hope you are having the beautiful weekend we are! I started my projects for the first post this weekend! I am so excited to share…. I love the loungers! Great find! Great to hear. Can’t wait to see! I’m with you – what time should I come over? ;-) Anything you choose, Shauna, will be amazing, and I can’t wait to see what the end result will be!